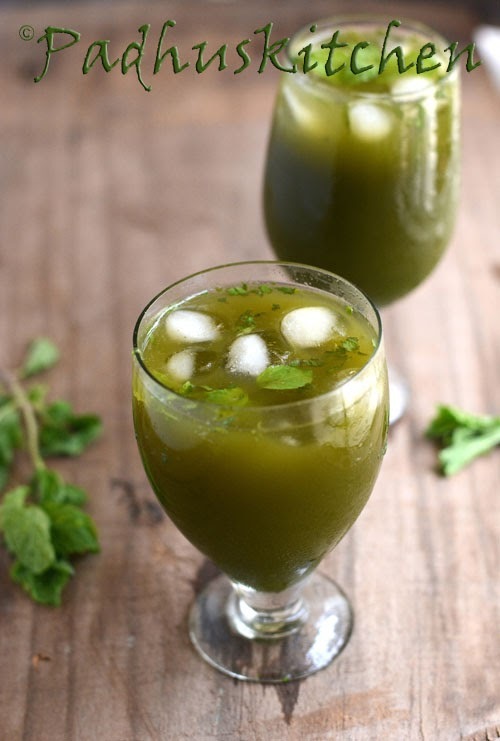 Lemon Mint Cooler is a very refreshing drink, perfect for summer. It is a blend of fresh mint leaves, lemon juice, chilled water and sweetener. I have abundant mint and lemons in my kitchen garden, so I prepare this cooler with fresh lemons and mint. In addition to being an amazing thirst quencher, it is very healthy. It is very easy to make and super delicious. Today let us learn how to make Lemon Mint cooler following this easy recipe. Squeeze juice from two lemons. Grind mint leaves, jaggery (I used powdered jaggery in place of sugar) finely using the lemon juice. Add a pinch of salt, chilled water and mix well. (I added little less water as once you add ice cubes, it gets more diluted). You can adjust the amount of water according to your taste. Top it with 3-4 ice cubes and garnish with fresh mint leaves. Enjoy! Note - If you use fresh homegrown mint as I have done, it is simply amazing. Learn how to grow mint at home.